Amazing how this forecast went from one inch to almost a foot by the time it's all over..
That forecast was totally wrong, we didn't get any new snow at all since yesterday morning. Like I said, forecasting has been poor lately. Was watching that storm on radar, and there were some very long, narrow bands of snow - it looked unusual. 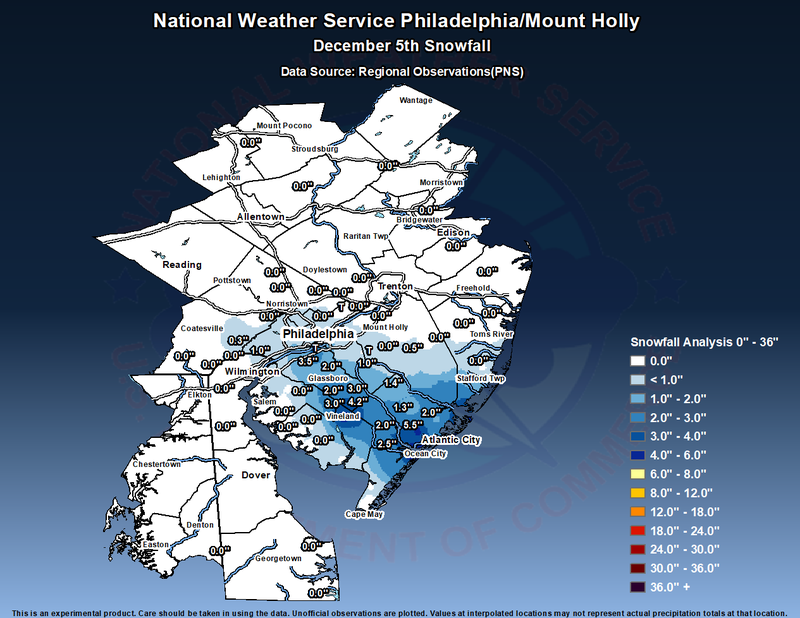 I can understand how it would be hard to predict exactly where they drop snow. Anyway, I'm happy that I didn't get the 11" worst case in the forecast. 3 to 4 inches is plenty. bobpbx and 46er like this. Even their totals are wrong, which is something that actually happened, not forecasted. Maybe their spotters were asleep. Note the 'we don't really know if its accurate or not' message on the bottom. We still have snow cover on the ground, streets are clear. Has not been above freezing yet today. Just got back from a walk in the woods, and the 2.5" number shown on that map is about right for me. There was over 3" on my car when I cleared it yesterday morning, but now it has settled and there is certainly less than 3" on the ground out in the woods. afternoon and night as arctic air pours into the area. Going through plenty of firewood already, it was still only 19 degrees here at 9:00 AM. If the stuff I am reading happens, that will seem downright warm. I'm off Monday, bring on the snow! Well, I believe the storm is expected on Saturday into Sunday, and current forecasts suggest rain with temperatures in the mid 40's Saturday rising to around 50 Sunday. Then we will get the flash freeze Sunday night, so everything will be a sheet of ice Monday. Yep, does not look like any white fluffy stuff for us, maybe not even any ice. North Jersey may get both. These extreme projections rarely pan out. We shall see. I am not looking forward to these lows. of wet surfaces causing very ice conditions. Dangerous wind chills Sunday night through Tuesday. Very cold beginning Sunday night thru Tuesday. These are air temps, not wind chill. "wet stuff is coming, we don't know what type it will be". That should be their new forecasting announcement. It was not supposed to snow here last night, so I did not put the car away. I got almost an inch on it now. Right on the money here... they forecast 1/2" and that is what I got. They've done it again. The Weather Company, i.e. IBM, has blown Intellicast out of the water; has it intertwined with Weather Underground. No announcement, just a morning surprise for some now angry folks on the eve of a significant weather event. Tsk, tsk, tsk; timing is everything. We received a dusting that is quickly melting.